Chef Shubert Ho has established that he’s an expert in the kitchen—his restaurants Bar Dojo and Salt & Iron (owned with business partner Andrew Leckie) are beloved Edmonds institutions. But at the new Market Fishmonger & Eatery, open since June, he and Leckie are doing something different. It’s a retail (everything from whole branzino to local salmon and “all the shellfish,” Ho says) and restaurant operation, with a small kitchen that churns out fish tacos, lobster rolls and the most excellent British-style fish and chips ($15), all available inside and at a walk-up window. 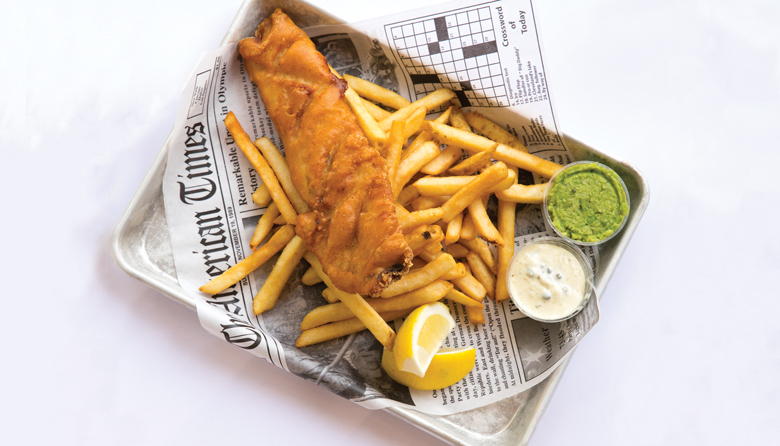 For those fish and chips, local rockfish is dredged in a combo of flour and cornstarch—for maximum crunchiness—plus Rainier beer and seasonings; the single, flaky mega-fillet is served with hand-cut fries and minty peas on a piece of newsprint. Nosh (the food truck currently holding the winning fish-and-chips trophy) may have some competition.